Where else do life-sized Tamagotchi Friends greet you at the door? Where else can you get a photo with the original Grumpy Cat? 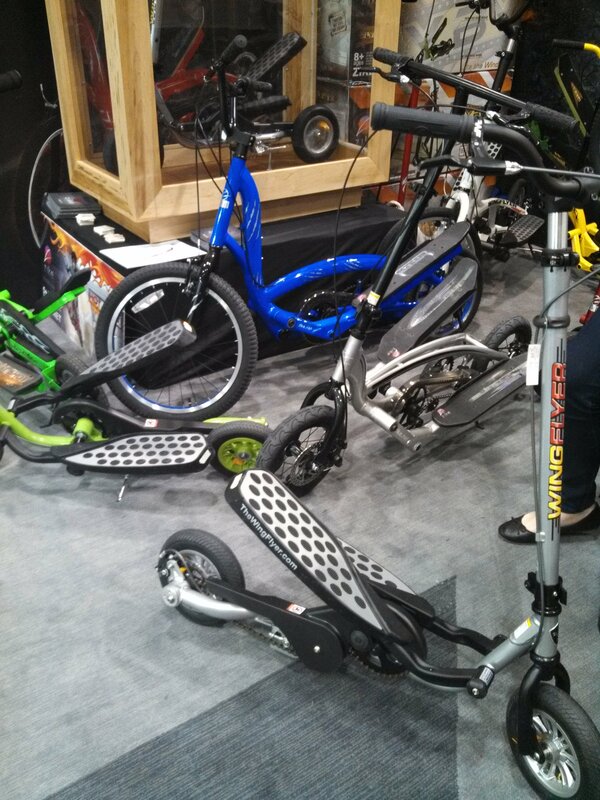 Where else can you get a glimpse into all the new toy trends that are soon to hit retailer shelves across the nation? The American International Toy Fair, sponsored by the Toy Industry Association, is the ultimate gathering for toy industry professionals. Designers, manufacturers, and retailers flock to this annual event at New York City’s Javits Center to showcase their wares, check out the latest in innovative product lines, and gather insight into the newest industry trends. Last week, the KaBOOM! team (Boomers) joined in the fun to explore new innovations for the Go Out and Play Collection and uncover ways to bring these great ideas from the fair to the families in the communities with which we work. One big thing we noticed was, like KaBOOM!, the industry focus is that children—and the adults around them—should seek quality play opportunities not just in the traditionally designated playspaces, but everywhere. Understanding that play cannot be confined to a specific activity type or place, the toys and trends we saw really promote active minds, active bodies, and being active together. But as good Boomers do, we inserted a little play into our work. While gathering crucial insights, our investigative play team made sure to test several products to make doubly sure how much fun could be had! There were a few that stuck out in the crowd. Our Boomers made it our mission to seek out the best active play products. 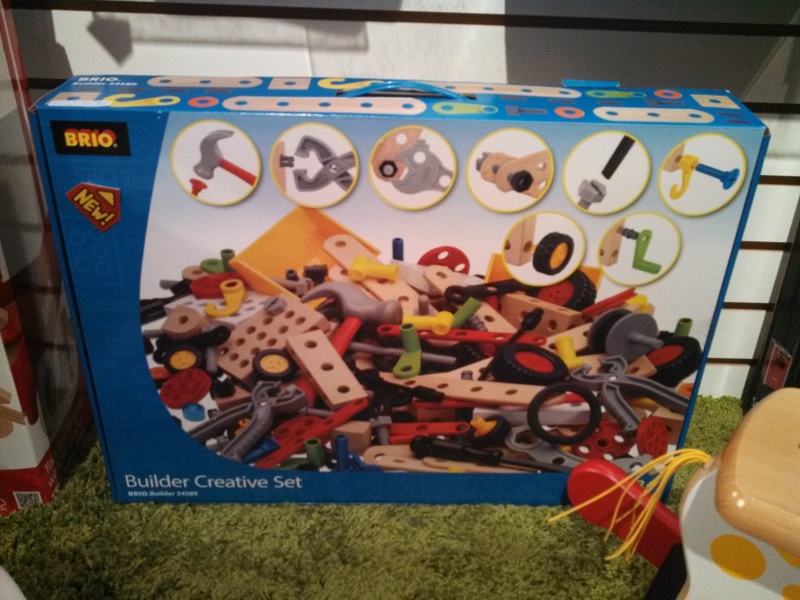 What we found were a lot of toys that make playtime edgier, challenging you to move faster, bounce higher or bring more friends into activities. The Wing Flyer by Zike combines elliptical pedal movement with a sleek scooter frame. We have to admit that we crashed a couple of times, but that just made it all the more fun! 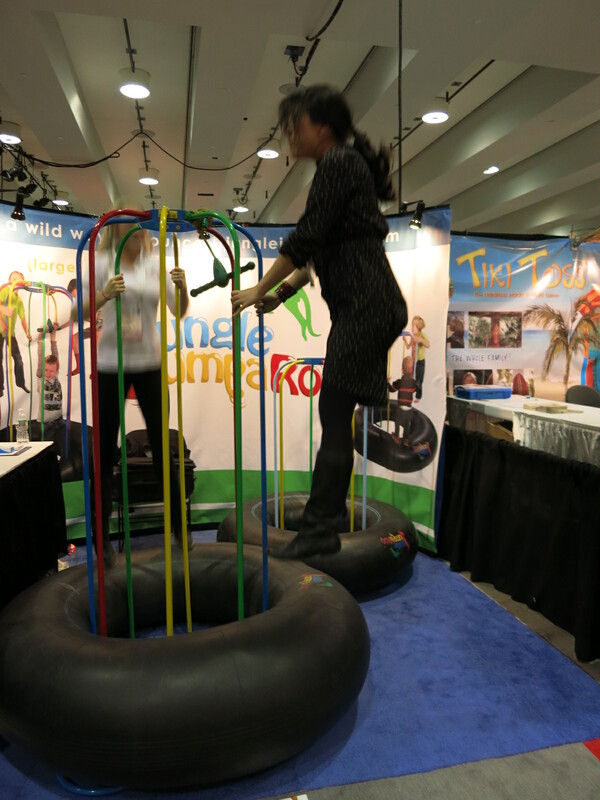 Boomers were impressed by the bounce in the Jungle Jumperoo. The promotional materials note that 10 minutes of jumping is equal to 33 minutes of running. We’ll have to do some more research into that claim, but we definitely all broke into a sweat after testing it out. 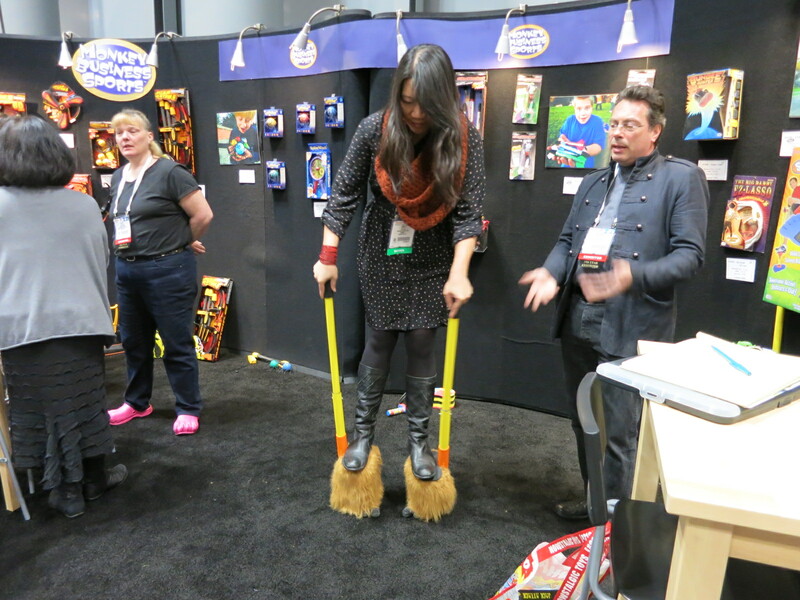 You wouldn’t think it, but walking on stilts takes a ton of balance, core strength, and coordination! It was a challenge, but our Boomer tester had a lot of fun trying! “Retro” games were also huge at this year’s Toy Fair. These games and toys brought back classic childhood games with a new twist. Giant Connect Four made the much-loved game larger than life! 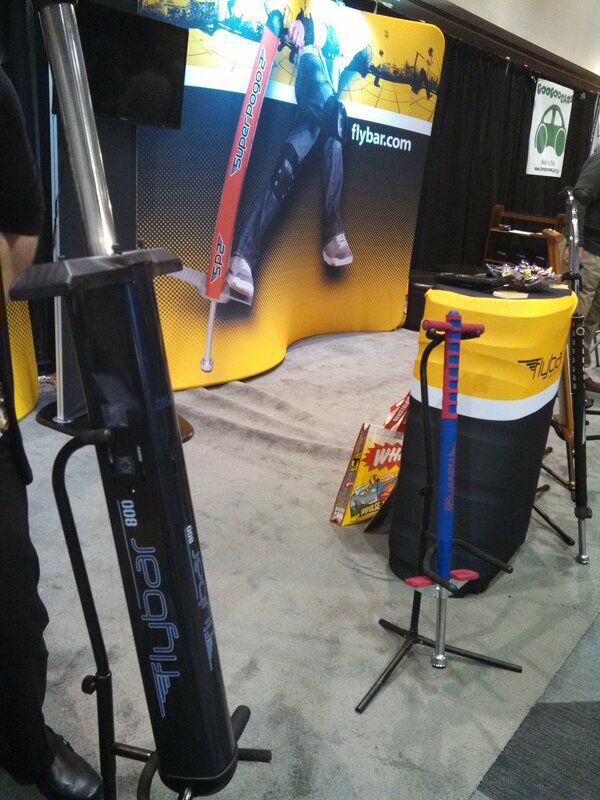 Made by the creators of the original pogo stick, the Flybar uses elastomeric thrusters to bounce fully grown riders up to four feet off the ground. Integrating Science, Technology, Engineering, and Math—also known as STEM—concepts was another big theme. 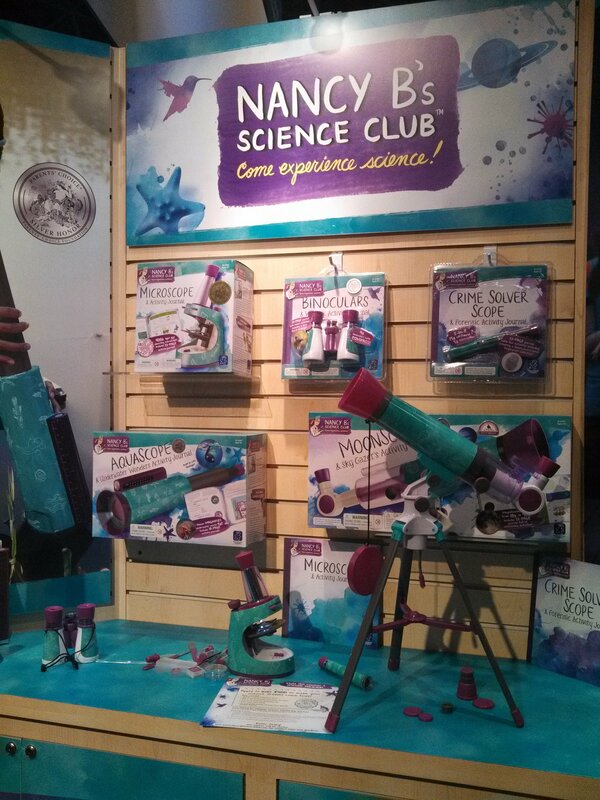 In particular, toys specifically geared to engage girls in STEM learning seemed to be almost everywhere we turned. In recent years, there has been growing attention given to the low number of women who are entering STEM-based careers. To try and bridge this gap, there has been an increase in popular demand for more STEM-inspired toys geared toward girls. This market has grown in popularity and has been taken on by a number of manufacturers. 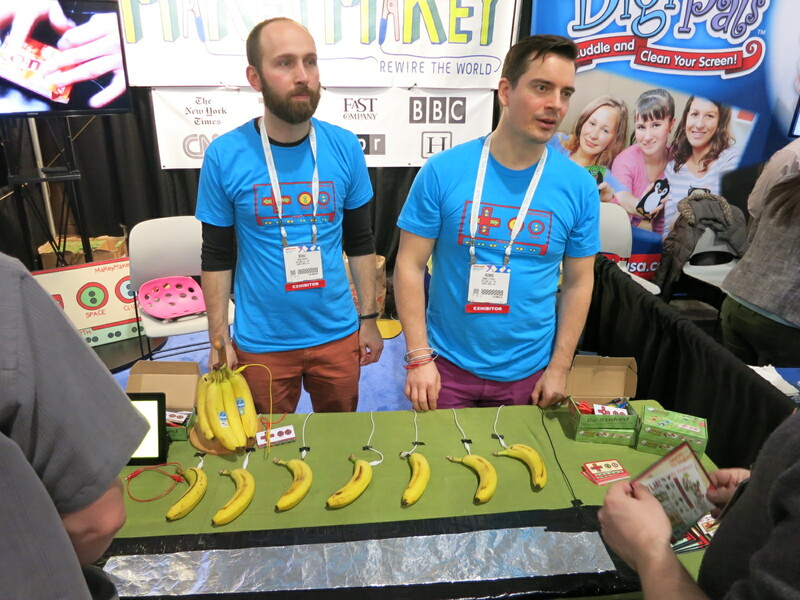 Makey Makey is one of the newest products that aims to teach basic circuitry through hands-on, well, making! Those bananas? They’re not for eating, though we were definitely hungry by the time we got here. They’re for making music! 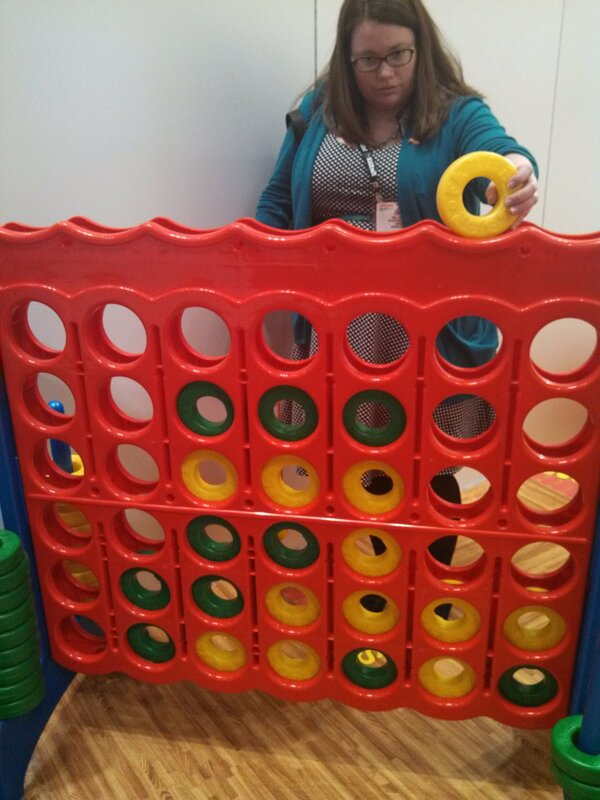 No Toy Fair would be complete without games that engage the creative spirit. Going further than the traditional arts and crafts kits, many products aimed to engage active and inventive minds in a collaborative setting. Why should Tom Hanks be the only one who gets to act like a "big" kid? 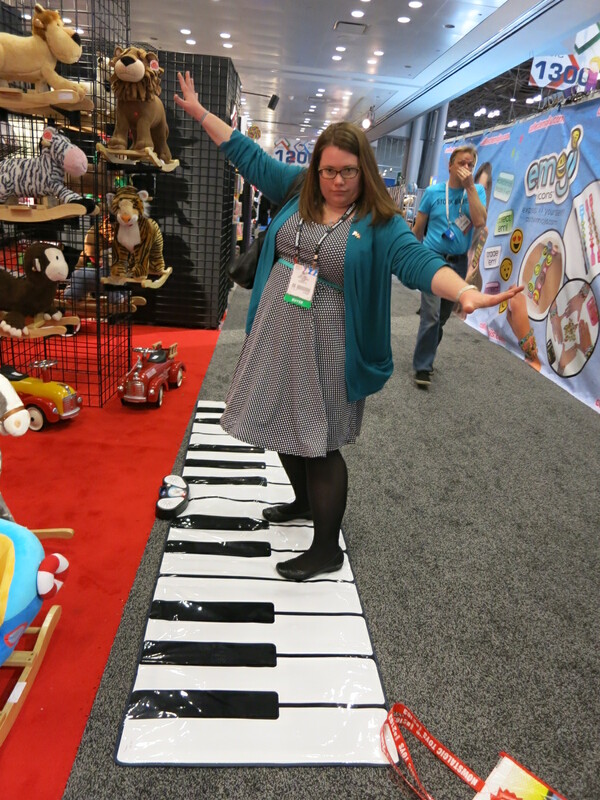 The Step-to-Play Giant Piano Mat encourages kids to make music while dancing. Bonus: They might even sit still during piano lessons. 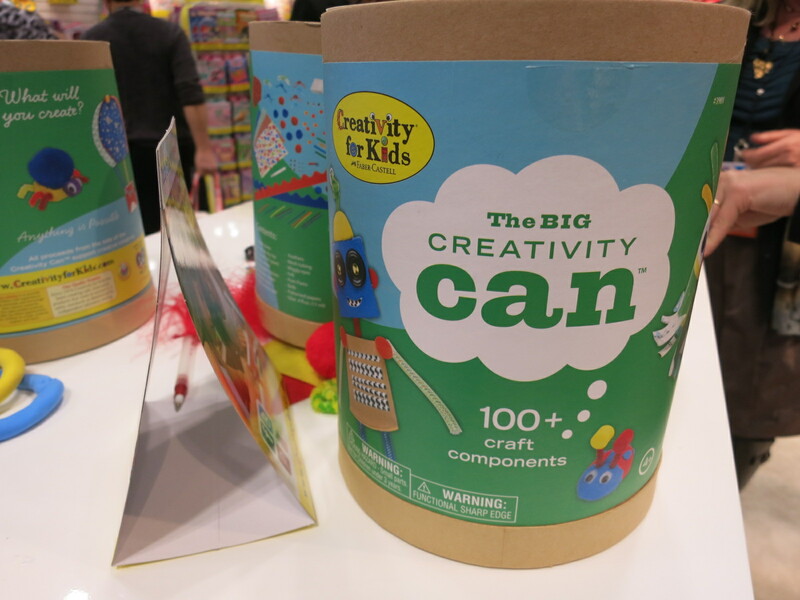 The Big Creativity Can by Faber-Castell includes a handful of open-ended materials—like clay, feathers and popsicle sticks—that allow kids of all ages to push their imaginations to the limit. Even though we found many great toys at the Fair, it’s good to keep in mind that getting a balance of active play every day doesn’t necessitate having a game or toy. Sometimes, all you need is a friend, family and a little creativity. For more information on the KaBOOM! Go Out and Play Collection and how you can help support KaBOOM!, go to kaboom.org/store.